M: This movement has changed my perspective about what organizing means. 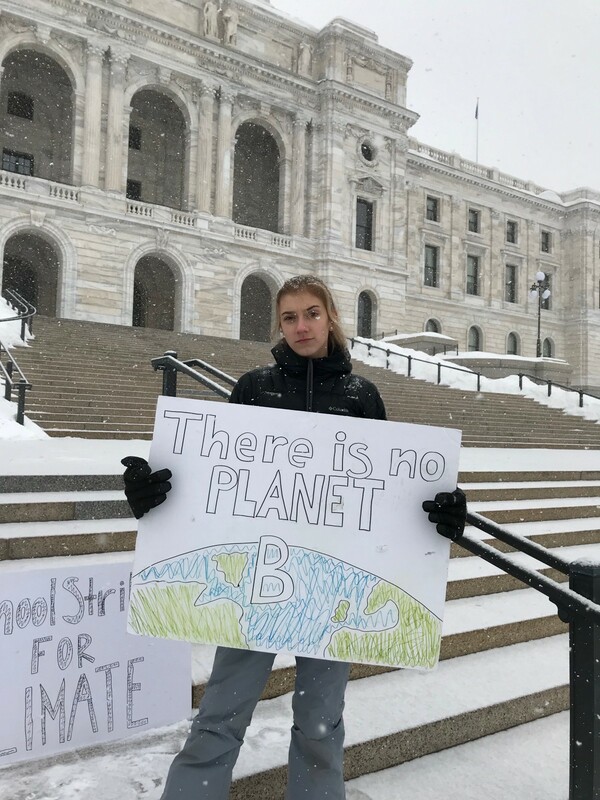 Before I was involved in the climate strike I was involved in other climate action, and I’m currently a part of Minnesota Can’t Wait, a statewide group that is currently drafting up legislation — not a resolution — containing actual legal language for a Minnesota Green New Deal. But when it comes to national and international organizing, I honestly have never experienced the amount of interest that the youth climate strike has gotten. People care about the strikes and we’ve gotten picked up by a lot of really major news organizations. A lot of people have taken notice. It’s really powerful on both the national and international scale. This movement has defied the odds and expectations for what is possible for young activists. M: We take two different forms of donations currently. There’s an online shop where you can purchase sustainable clothing that has US Youth Climate Strikes branding on it. Part of the proceeds go to our movement. We’re also fundraising currently through GoFundMe and have raised $6,000 so far [$10,406 as of publishing]. We’re going for $15,000 because striking is expensive. We’re also trying to get a stage at some of our bigger locations, like DC, NYC, and Miami, for the March 15 strike. M: The reason that politicians are in opposition to climate action is not because of the will of the people. The majority of Americans believe in taking action on the climate. Politicians’ reasons have to do with the money of fossil fuel organizations and companies. Politicians are so deep in the pockets of fossil fuel corporations that they fail to see the will of the people. I think that is one of the main issues when it comes to legislative action on climate change. To solve that, I think we have to make it politically impossible not to act. If we make the will of the people strong enough, then we can fight the money from fossil fuel donors and we can make sure that politicians will feel the burn if they don’t support climate action. I think we’ve seen that already in how all the the major Democratic Senate candidates have supported the Green New Deal. It has become politically bad for them to not do so. I think that is what our goal is: to make it so that climate action is bipartisan, necessary, and understood at the magnitude and scale that scientists describe to us. I think politicians will follow suit if the general public changes its mind and is very much in opposition to not acting. I think that’s already happening. We’re trying to change the mind of the general public by having strikes, by showing that young people are angry about how there’s no progress on climate change currently. M: The March 15 strike is not the end of us — it’s just the beginning. There are some past climate movements that lost momentum after their initial big events, and we want to make sure that that is not something that can be said about us. We want to make sure that once we have this event, the movement doesn’t stop and in fact gets even stronger with our momentum. We have some long-term plans too. We’ve been contacted by the U.N to potentially speak at the climate summit in September of 2019. We will also continue to grow our movement, from the national and local scale to the international scale, and collaborate with other movements. We want to make sure that we are heard and seen by the media, by the regular bystander, by everybody. M: Yes! In early May there will be another international climate strike, so we’re going to try to get people out for that one as well. There’s a chance that this will be a recreation of the March 15 strike, but we want to give it a twist. When continuing momentum, it’s important to change the strategy to keep the attention of the public’s and the media. This first strike will just be a grassroots-organized strike. For the next one, we might do some sort of demonstration. I know that in New York City, they’ll be doing a die-in. After that, I think we’ll want to do something similar. We want the next strike to culminate our intersectionality and to use symbolism. It’s going to be bigger than ever, more important than ever, more urgent than ever. That’s our goal. In Kind is a platform made to bring inspiration, positivity, and kindness into our readers' lives.